I use Mint for tracking my website visitors (all 3 of you) and it’s pretty fascinating to see the searches that bring people here, people from all over the globe. 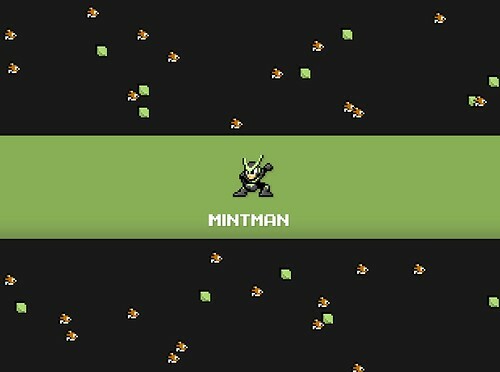 However I’ve only just realised that there are a number of commands, mostly hidden I think, that allow you to dig into Mint just that little bit more. Peppermint Tea, a site that pulls together all the latest peppers for Mint has a list of the known commands. Errors and benchmarks are particularly handy for those misbehaving peppers. However it’s the Easter Eggs I loved. I’m sure someone will see it as a waste of code and that more time should be spent fixing bugs…..pah! Give me an Easter Egg any day. Anyway, some interesting stats for this site. Internet Explorer visits have dropped to 53% with IE7 making up 60% of that total. Firefox is still slowly gaining at 37% and since moving to the Mac Safari has moved from 2% to a whopping 5% – none of that is me by the way. One stat that hasn’t changed is operating systems though – Windows users still makes up the vast majority of visitors at 89%, Mac with 10% and Linux with 1%. I guess that reflects reality pretty well. The biggest surprise is how many visits are from users with small’ish screens. 1024*768 is the res for 43% of visitors, with 1280*1024 coming in second on 30% although the top stat is reducing quite quickly over time. Maybe I was a bit quick to move to a wider theme? Final stat’s – 44% of visitors are from the UK, PSP Warez is the most common search and GTA Liberty City Stories – Custom Soundtracks is the most visited post. Now this is nice. The latest PS3 update (out tomorrow in UK) add’s some great features. A pretty impressive update that has come out of nowhere. Does this mean I could stream media from my NAS to the PS3 and view that media on my PSP anywhere in the world? I’ve finally got round to implementing my own site theme. Although I’m not entirely happy with it and it still needs some tweaking on certain pages it had been unchanged for two weeks on the test site and with time looking to be limited over the next month or so I thought it was time to take the plunge. The main idea behind the theme was to keep things simple, increase white space and drop the graphics. I’m far preferring sites with little or no graphics on them so that was my main aim. At the same time I wanted the theme to be a little wider than most others to take advantage of my desktops and also those of most of my visitors (thanks Mint). Cross browser compatibility was also important as more than 50% of the real visitors to the site are on IE and around 10% on Safari so I wanted to make sure it looked much the same across all platforms (thanks Parallels). It mostly does with some tweaking still to do to suit IE6. I’ve also dropped the number of plugins I have installed and load times have been greatly reduced. The about page probably takes the most time although a misbehaving last.fm plugin has been disabled which helps. I’ve also created a tumblelog site which is acting as a ‘lifelog’ pulling together a number of feeds. I’ve been very impressed with Tumblr and with new functionality being added frequently and paid for features in the pipeline I can’t see me dropping it. Indeed I’ll probably register a new domain just for the lifelog. So there you are, hope you like it. I can’t promise it will stay for long as I can be pretty fickle about what I like and dislike but it will do for now and at least meets some of the objectives I set out with. Now I just need to resist the temptation to constantly change. I felt it was worth playing more than a handful of games before commenting on Halo 3 as it takes time to get used to some of the more subtle changes. The most noise on the net at the moment is with the quality, or lack of, of the graphics. I’ve been happy with them but they aren’t mindblowing. I’ve been impressed with the bubble shield, the increased detail on all the maps, the water effects and the higher res that everything is presented in. While it’s a beta I don’t expect them to change much between now and September although the single player may have an extra sheen as seen in previous Halo games when compared to multi-player. The three maps in the beta are all very different, new and provide fresh challenges. Most disappointing is Snowbound as it’s fairly small with not much detail. The snow effects are nice but there isn’t much cover on the map leading to quick deaths. Still, the Ghost on this map does allow me to mow down folk. Highground is a fantastic map consisting of a beach, with a main path heading up to an abandoned base. Lot’s of hiding places, multiple routes to the base and also the chance to try the Mongoose. Think smaller, aster more vulnerable Warthog. Great fun. Finally there is Valhalla which is a more traditional Halo map – large with a base at each end and in a valley with undulating terrain and a stream running through it. The water really slows the Warthog down and when you die in the water your body is carried by the currrent and the sound is muffled…a great touch. The new weapons are a mixed bag at the moment. The Spartan Laser is very powerful but balance is provided in that it takes 5 seconds to charge. Machine gun turrets are now removable but really slow you down – still makes an effective weapon for mowing down groups. The Brute Spiker is a great new weapon close up – dual wielding seems to be most effective and does a lot of damage. Most notable is that the pace has dropped slightly. It feels a tad slower than Halo 2 but if anything this has made the game feel even better. One of the early rumours was that the game physics could be altered by the host so that gravity, speed, weapon power etc could be altered so if true it would be easy to adjust running speed. I’m not convinced by offerring these variable options though – every game could feel different, odd even for all those playing apart from the host. I guess this won’t apply to ranking matches if there is such a feature. Certainly the first 20 or so games for me have been excellent and are a great taster for the full release in September. In an attempt to beat the de-rankers you now have experience point (Ranking Points) which allows matchmaking to be refined and be based not just on your current skill level but also your experience. 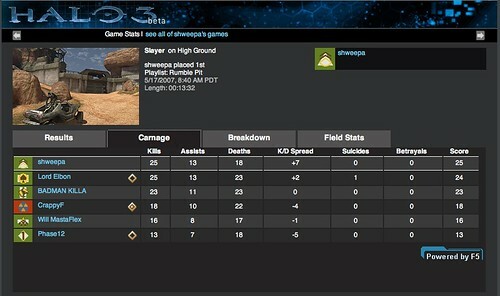 After the lack of party features in Gears of War it’s great to form your own party and take your friends into a game. If this was in Gears of War I think I and many of my friends would have played it more. It makes for a great game online when it’s your friends rather than strangers your fighting with. The speech is a little awkward though. By default team speak is off with only proximity chat on. Most games with strangers have been fairly quiet so far. With friends in your team it’s a bit more vocal but I would have preferred that team speak was default rather than a button press. I guess the most annoying feature is the time limit as the beta ends on June 10th. The last three nights have seen some fantastic online games – mostly close games and a great laugh. Maybe it’s for the best as no doubt we would be tired of the maps by September. I’m in no doubt however that this is another classic that will eat up as much time as Halo 2 did. Roll on Sep 26th – my pre-order has already been made. Nullsoft have update Connect360 to play nicely with the 360’s spring dashboard update. While this is good news as after the update it was a bit buggy the best bit for me is that .mov files are now supported. Well, WMV+WMA, H.264 and MPEG4 are actually supported now which means the 360 alongside Connect360 can playback all my video podcasts plus movies stored on the Mac. Fantastico. I’m sure the Aple TV menu system is slicker and it’s obviously quieter but the 360 makes for a great free alternative which I already own.